This is me, Kate, and my husband, Heiko. I am wearing our son, Henry, and Heiko is wearing our son, Jack. The boys are just over one year old in this photo (they are twins). My mother took this rare photo of the four of us together (I am almost always behind the camera, and as you can see in the photo, even from in front of the camera, I’m trying to “direct” my mother as to how to best take the photograph!). I moved away from my native Texas with my husband several years ago, and, of course, after having children, I really missed home and missed being close to family. 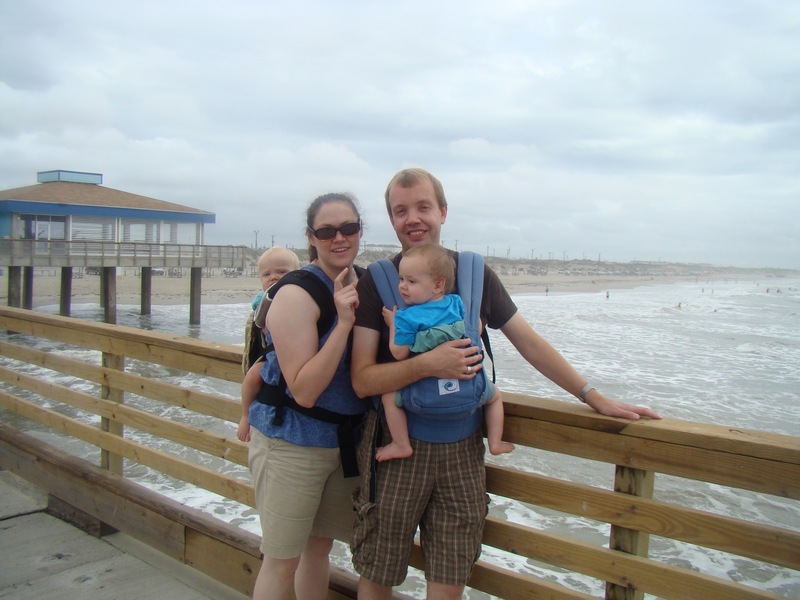 We took our boys back to Texas around their first birthday for a monthlong visit. This photo was taken toward the end of that trip, a first visit to the shore at the north end of Padre Island on the gulf coast near Corpus Christi. The weather wasn’t great, so we spent most of our time walking here on this fishing pier, enjoying the gulf from above. In this photo, we are each using an Ergo. These carriers were sent to us by a friend when my boys were about 4 months old, and from about 5 months onward, we used them constantly when we were out and about as a family. When I was on my own, I frequently used a double stroller, but always had an Ergo in the basket in the bottom in case someone got fussy and needed a Mama-Contact Attitude Adjustment. I *did* attempt tandem wearing, but it just never worked for me (bad back, plus two heavy, squirmy boys made it more difficult than it might have been otherwise). I also used various slings, and in the very early newborn days, one boy really loved being in the Baby K’tan, but I personally found structured carriers to be best for us. On our way back to our current home from our Texas trip, we stopped in New Orleans (my favorite city, aside from home…), and the only way that stop was possible was with the use of the Ergos. I have so many photos from that time with all of our various carrying permutations– one in my arms/one on my back, one on my front/one in the stroller, one on Papa/one toddling along with me. Just so much flexibility. We were babywearing at this time because I’m not sure how else we would have managed. The pier wasn’t appropriate for a stroller, and one child wasn’t even standing on his own yet (and the other was still doing the adorable drunk-like stumble-sway-toddle kind of walk). Mobility was usually our main reason for wearing them. Safety was probably the second reason (no squirmy little ones tumbling out of a loose stroller strap, which happened more often than I care to admit while using our second-hand travel stroller…), and general closeness was the last reason. I loved having them snuggled up against me, and it was not long after this that they began to resist wearing– too many places to go, things to do! No time for riding in a pouch! Sigh. I love this photo because it brings back so many memories of this trip and of this time in their lives. The first year with twins was pure chaos, and I remember thinking at this time that I had really accomplished something: I survived a whole year of twin parenthood! It was hard–really hard– but around this time, we started seeing some of the rewards of parenting two at the exact same age at the exact same time. It was when we started to feel like maybe, just maybe, life might start to be about living as a family of four, instead of living like a pair of caretakers and their two little charges. It really was like starting to LIVE instead of just surviving. Thanks so much for sharing our story! My pleasure Kate! Thank you for taking so much time in writing such a thoughtful story. =) Good luck with the twins!